Fatigue has become progressively more prevalent as technology has developed a greater amount of equipment, such as automobiles, aircraft, compressors, pumps, turbines, etc., subject to repeated loading and vibration. Today it is often stated that fatigue accounts for al least 90 percent of all service failures due to mechanical causes. One of the most useful properties of metals is that they can be bent or stretched and they will spring back to their original shape. Even if they take a "permanent set” they continue to be strong. This allows metals to be formed into shapes and is why they rarely shatter in spite of their great strength. The great lesson of time is that no event is truly reversible no matter how it seems. Even though a piece of metal may spring back, it has been altered by bending. In fact metals are altered by most of their experiences. One economically important aspect of this state of affairs is that repeated deformation of metals causes them to crack and break. This cracking process is called fatigue. It is not a property of metals alone. Plastic materials behave in a similar way. Brittle materials such as glasses and ceramics undergo even more complex changes when repeatedly bent or loaded. But, their tendency to simply break from overloading obscures fatigue in them. Fatigue is the most important failure mode to be considered in a mechanical design. 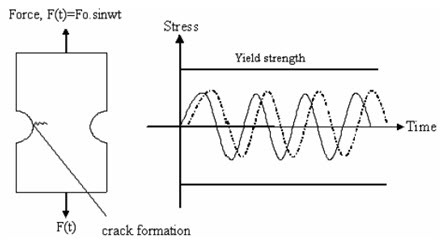 Under the action of oscillatory tensile stresses of sufficient magnitude, a small crack will initiate at a point of the stress concentration. Once the crack is initiated, it will tend to grow in a direction orthogonal to the direction of the oscillatory tensile loads. There are several reasons for the dominance of this failure mode and the problems of designing to avoid it: (1) the fatigue process is inherently unpredictable, as evidenced by the statistical scatter in laboratory data; (2) it is often difficult to translate laboratory data of material behavior into field predictions; (3) it is extremely difficult to accurately model the mechanical environments to which the system is exposed over its entire design lifetime; and (4) environmental effects produce complex stress states at fatigue-sensitive hot spots in the system. It can be thought that fatigue can involve a very complicated interaction of several processes and/or influences. Fatigue failures are often catastrophic; they come without warning and may cause significant property damage as well as loss of life. 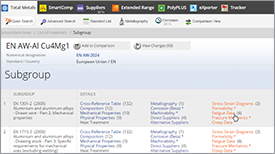 The goal of such new elements in the design process is to perform fatigue and durability calculations much earlier, thereby reducing or removing the need for expensive redesign later on. Actually, fatigue damage is related to cycle amplitudes or ranges and not to peak values. Therefore, in any kind of loading, fatigue damage is caused by statistical properties such as amplitudes and mean values. The majority of engineering failures are caused by fatigue. Fatigue failure is defined as the tendency of a material to fracture by means of progressive brittle cracking under repeated alternating or cyclic stresses of an intensity considerably below the normal strength. Although the fracture is of a brittle type, it may take some time to propagate, depending on both the intensity and frequency of the stress cycles. Nevertheless, there is very little, if any, warning before failure if the crack is not noticed. 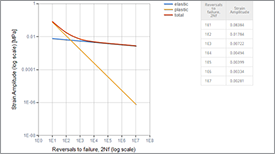 The number of cycles required to cause fatigue failure at a particular peak stress is generally quite large, but it decreases as the stress is increased. 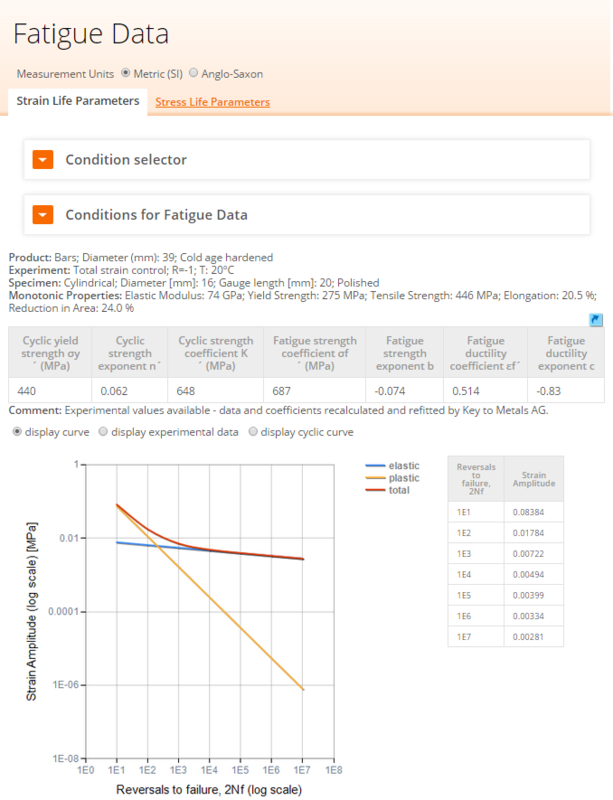 For some mild steels, cyclical stresses can be continued indefinitely provided the peak stress (sometimes called fatigue strength) is below the endurance limit value. A good example of fatigue failure is breaking a thin steel rod or wire with your hands after bending it back and forth several times in the same place. Another example is an unbalanced pump impeller resulting in vibrations that can cause fatigue failure. 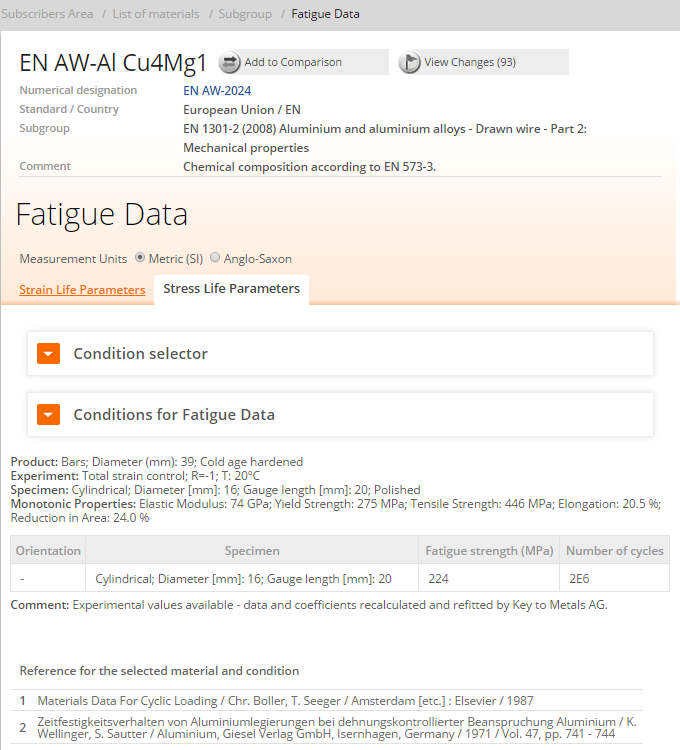 The fatigue behavior of a specific material, heat-treated to a specific strength level, is determined by a series of laboratory tests on a large number of apparently identical samples of that specific material. This picture shows a laboratory fatigue specimen. 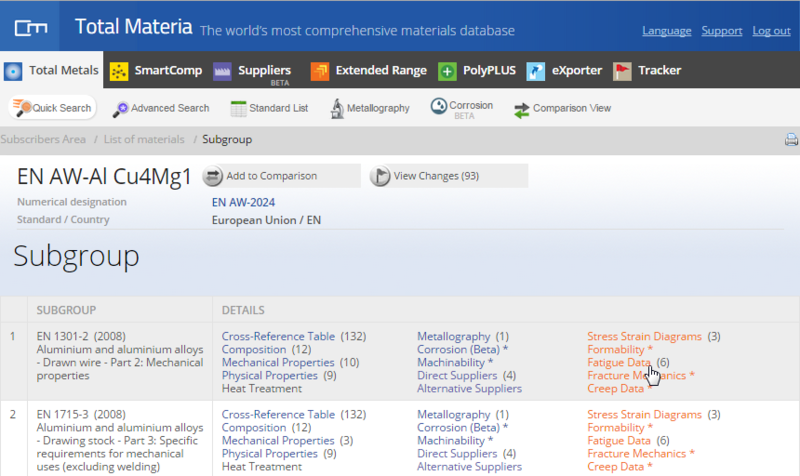 These laboratory samples are optimized for fatigue life. They are machined with shape characteristics which maximize the fatigue life of a metal, and are highly polished to provide the surface characteristics which enable the best fatigue life. A single test consists of applying a known, constant bending stress to a round sample of the material, and rotating the sample around the bending stress axis until it fails. As the sample rotates, the stress applied to any fiber on the outside surface of the sample varies from maximum-tensile to zero to maximum-compressive and back. The test mechanism counts the number of rotations (cycles) until the specimen fails. 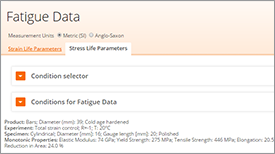 A large number of tests are run at each stress level of interest, and the results are statistically massaged to determine the expected number of cycles to failure at that stress level.